Islam is a monotheistic religion originating in Saudia Arabia in the 7th century. In Islam, Muslims (those practicing Islam) need to follow the Five Pillars of Islam in their daily lives. Although Islam is very similar to both Judaism and Christianity, it still has some vital differences. Shahada is the declaration of the belief in one God and the testimony that Muhammad is the Messenger of God. This is the most important pillar for Muslims to follow. As a Muslim, this is the first thing that one needs to believe in. This declaration of faith is called kalima. In order to convert to Islam, one needs to publicly recite the Shahada in Arabic. 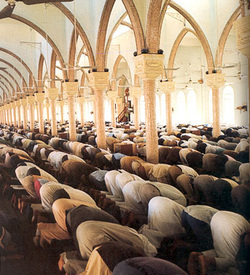 Salaat is performed by repeating a certain unit of actions and words called a raka'ah. Each salaat varies in the number of raka'ah that are prayed. The minimum number of obligatory raka'ah that must be prayed is called fard and also varies with each salaat. If one prayer is missed during any time of the day, it can be and must be made up during a later time of day. During the prayer, one is to silently recite verses from the Quran. These verses are of one's one choosing but the order in which one can recite particular verses varies based on the time of day. Prior to performing salaat, one must cleanse themselves in a process called wudu. Muslims are to be clean while praying, hence wudu is a purifying ritual. During wudu, Muslims wash their hands, mouth, nose, arms up to the elbows, face, ears, hair, and feet three times each in that order. After completing this process, Muslims are to wear modest and loose fitting clothing while they pray. In prayer, a Muslim can thank and praise God, ask him for forgiveness, and ask for guidance. This is the one way in which Muslims are able to with Allah. Ramadan is the holy month of fasting. In this month, all Muslims (children who have reached puberty included) must fast for one entire month from sunrise to sunset. During fasting, Muslims cannot eat or drink anything. They break their fast when the sun sets and are permitted to eat only until sunrise the next day. This is done every year but the time is based on the lunar calendar. Ramadan's timing is determined in correspondence with the moon's cycles. 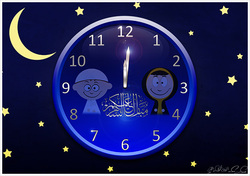 The end of Ramadan is celebrated with the holiday Eid al fitr. This is one of the two major holidays in Islam. The purpose of fasting during Ramadan is to administer self discipline and self control. Muslims are to go about their usual daily duties while fasting in order to be grateful for what they do have in life. Through fasting, Muslims are able to learn how much they have been blessed and truly empathize with those who do not have the luxuries they possess. If a Muslim is sick or for any other reason cannot fast, he or she may be exempted from this obligation. However, in the Quran, it is mandated that if a Muslim cannot fast, he or she needs to feed a poor person for the days they do not fast. Today, most Muslims simply give charity for the days they do not fast, or if they can fast later on, they make it up after the month of Ramadan. Hajj is the pilgrimage to Mecca that must be made at least once in a lifetime by every able-bodied Muslim who can financially afford to do so. Hajj occurs in the twelfth month of the Islamic (lunar) calendar and hence, its timings vary from year to year. Each year, millions of Muslims attend Hajj. This pilgrimage consists of about twelve rituals. The first and one of the major rituals involves encircling the Kabaa, the House of God, in a counterclockwise manner seven times. This starts off a week of rituals that end with the second major holiday in Islam, Eid al adha, or the festival of sacrifice. Zakaat, or charity, is an obligatory charge on a Muslim's earnings. Usually, it is a certain percentage given away from one's salary. Muslims generally pay the zakaat during the holy month of Ramadan. The Arabic word for God is Allah. In Islam, Allah is the most powerful and completely above the imagination of a human. Thus, Muslims are advised to never try and picture Allah, but only to worship him as the creator and protector. The Quran is the Islamic holy book. The passages in the book are believed to be revelations made by God to the Prophet Muhammad. This is why it is said that the Quran was written by the Prophet. In the Quran, Muslims are provided with moral guidance. The Quran is a guide for Muslims concerning what should and should not be done. 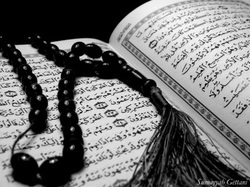 All Muslims are required to read the entire Quran in Arabic once in their lifetime. Because it is in Arabic, the Quran is read from right to left. Also, prior to reading the Quran, Muslims need to perform the cleansing ritual, wudu, that is also done before they pray. Without doing so, Muslims are forbidden from touching the book. Islam believes many of the prophets in other world religions to also be messengers of God. It believes in Adam, Noah, Abraham, Moses, and Jesus. Because of this fact, Muslims think Islam is the final religion revealed by God. Islam is very similar to both Judaism and Christianity. Thus, Islam believes in the prophets of both of these religions as well. Islam also believes in the existence of Angels. These Angels are not only recording our good and bad deeds, but they are all around us. Islam believes that even the when Muhammad was first contacted by God, it was by the aid of an Angel. In addition, Muslims believe that there are Angels waiting for us in our graves. When a Muslim is buried, there soul is taken from the grave by the Angels. Similar to other religions, Islam also believes in a Day of Judgement. Muslims do not know when this day will be, but the date has already been determined by God. On the Day of Judgement, every human will be judged on their time spent alive. Muslims believe that they will either be sent to Jannah (Heaven) or Jahanam (Hell). In Jannah,or paradise, Muslims believe they will experience eternal bliss. In Islam, it is said that if one follows the guidance provided in the Quran, he or she will be sent to Jannah. In Islam, males and female are both expected to dress in a modest way. The different way people dress are an attribute to how conservative they are as a Muslim. For males, they should cover most of their bodies and it is advised to dress covering the knees. Also, men should not wear silk clothing or gold. Muslim women are also required to cover most of their bodies. The Quran directly advises women to cover their chest, their legs & arms, and to not dress in a revealing manner. The headscarf, or hijab, that is worn by many Muslim women is a choice and not an obligation in Islam. Many times, women wear it in a way to show obedience to their God. They also wear it for protection against harassment and molesting. Every Muslim has his or her own degree of modesty and different interpretations of conservative. This woman is wearing the hijab, a traditional head scarf. 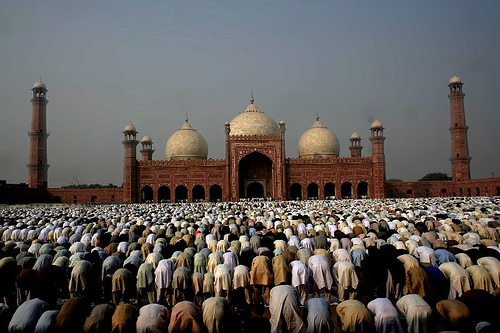 Eid-al-Fitr is the major holiday celebrated at the end of the month of Ramadan. After one month of fasting, Muslims congregate in the mosques (worship area) to pray. Every culture has its own way of celebrating Eid. However, in most cultures, food plays a major role. Ending one month of self discipline and control, Muslims enjoy wide varieties of food. Most cultures also buy new clothes to celebrate the day. Because Islam is a religion that emphasizes family relationships, Eid is also a day many Muslims spend celebrating with their families. Eid-al-Adha is very similar in its festivities as Eid-al-Fitr. However, Eid-al-Adha, or the festival of the sacrifice, also has a symbolic background. Muslims believe that the Prophet Abraham was ordered by God to prove his obedience and love. As an ultimate test of faith, God commanded Abraham to sacrifice his own son. When Abraham was in the process to do so out of the faith in his creator, his son's position was taken instead by a lamb. This story is remembered by Muslims every year during Eid-al-Adha. Muslims all over also sacrifice lambs and other animals in a symbolic gesture in remembrance to this story. In Eid-al-Adha, most of the same festivities are repeated in celebration. 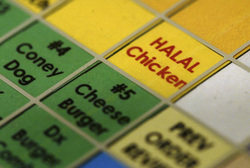 Typically, Muslims are required to eat Halal food. Muslims are forbidden from eating any pork or its products. Everything in a Muslim's life can be Halal(permissible) or Haraam(forbidden). This is mostly related to the diet of Muslims. In Islam it is not Halal to eat any pork or its products, animals slaughtered in the incorrect way, alcoholic drinks or any type of intoxicants, carnivorous animals, or birds of prey. Any food contaminated with these things are Haraam as well. In order to make meat Halal, it must be slaughtered according Dabiha. In this method of slaughtering animals, a Muslim in good mental condition and faith must slaughter the animal. A sharpened knife needs to be used in order to make a swift, deep incision that cuts the front of the throat, wind pipe and jugular veins but leaves the spinal cord untouched. Also, the head of an animal must be aligned with the Kabaah. In addition to this, the animal should be slaughtered in the name of Allah. These rules need to be followed for all meat except for fish and most seafood. 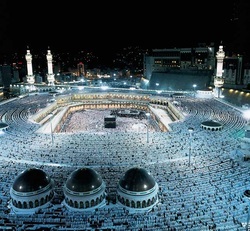 Islam came about during the 7th century in Mecca, Saudi Arabia. The appearance of this religion changed many aspects of society. First and foremost, Islam presented the idea of only one God to a fully polytheistic region. Before Islam, most Arabs still worshiped tribal gods and idols. As Islam spread, the idea of one God gained acceptance. Islam also changed the status of women in the region. Different from pre-Islamic times, Muslim women were given rights over their inheritance and their earnings. Also, in marriage, the consent of the woman was imperative. In addition, in Islam, mothers were given much more importance and respect than the fathers. Although Islam did not give women as much authority as men in many aspects of life, it did obtain women much more freedom than their previous held positions. Islam also fostered more trade and commerce. Trade was seen positively in the religion because the Prophet had been a trader. Also, the urbanization that grew along with the spread of Islam promoted trade. In emerging Islamic communities, the caliph or successor of Muhammad, eventually became the absolute monarch of the empire. Initially Islam did not allow for any priests due to the fact that no one should stand between a believer and God. The ulama, the religious scholars, then only served as judges, interpreters, or prayer leaders. Some of the ulama became deemed as sultans, or rulers, and submitted to state authority. Although the religion of Islam was built off of older religions, it created revolutionary changes in Arab society.